I am more than likely to spend $50 on a foundation but when it comes to lipgloss I find it hard to justify spending so much. 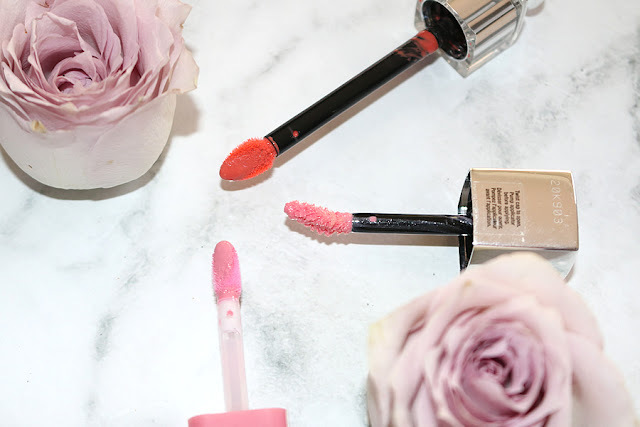 The Dior Fluid Stick is a beautiful product and one of my favourite formulations of lip gloss but it does come with the hefty price tag of $. I have recently seen drugstore dupes emerging on the market that are a lot more affordable but have definitely been modeled after the Dior one. 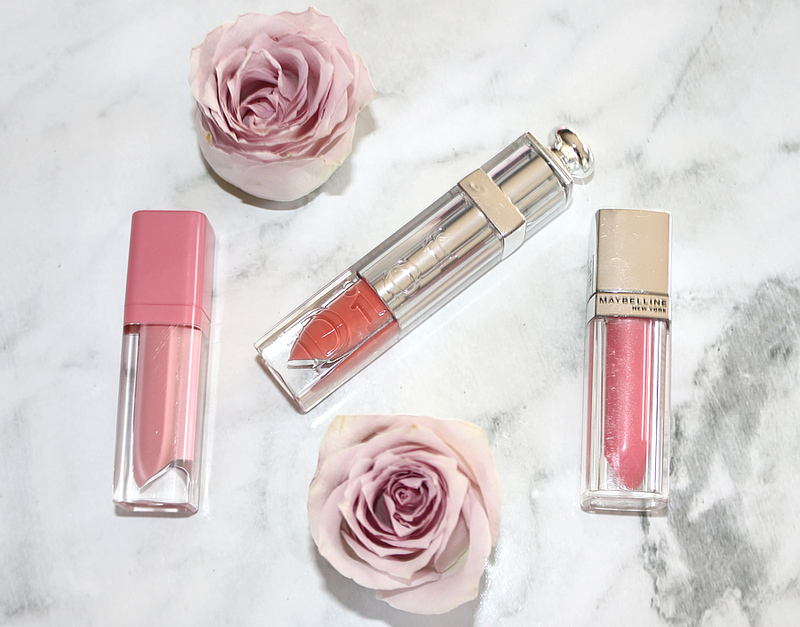 So I am putting two of these dupes to the test and comparing them against the authentic Dior Fluid Stick to reach a verdict on which gloss is most worth purchasing. Let's start off with discussing the high end product itself and this luxury lip gloss is a beautiful splurge item. At over $50 each they are definitely pricey but extremity high quality. What stands out most to me is how smooth and creamy the consistency is because it feels silky smooth on your lips. The formulation is pigmented while still being lightweight and comfortable to wear. It has a luscious glossy finish and wet shine to it. The doe foot applicator is larger than the average gloss but this makes application quick and easy as you can get a full application in a few swipes. You can read more about this product here. I only recently saw this at Priceline and when I did I immediately knew I had to try it because it had an uncanny resemblance to the Dior one I love. I also fell in love with this beautiful dusty pink colour which was surprisingly pigmented, especially considering the price. The design of the packaging is comparable to that of the Dior one and and doe foot applicator is similar but smaller in size. It is smooth and creamy on the lips also which is really impressive since a lot of cheaper glosses are quite tacky. What is even more impressive is the price with this product retailing for just $4.95 from Priceline. There are only four colours released in my local Priceline stores but I know that other countries offer a larger variety. This is a fairly new release onto the market and I would highly recommend giving it a go. You can read more about this product here. These came out well over a year ago and when they did I immediately drew comparisons to the Dior Fluid Sticks even though I hadn't tried the Dior ones yet at the time. This product has my least favourite applicator out of the three because it is quite stiff and small which makes application difficult at times. The price point is a bit steep costing $18 per gloss but in comparison to the hefty price tag on the Dior one you are still saving yourself money. Not only that but there are so many beautiful shades in this collection that you are spoilt with choice. It is the most sheer out of the three options so if you like subtle lip colours then these are great for you.You can read more about this product here. 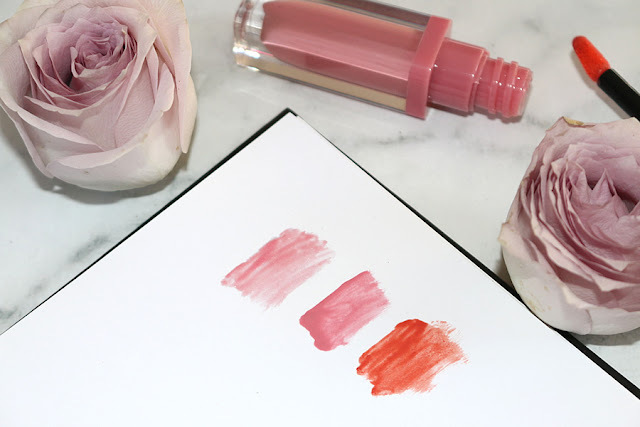 Above, the first swatch is the Maybelline Color Elixir, the second swatch is the Essence Liquid Lipstick and the third swatch is the Dior Fluid Stick. The Essence product has a similar pigmentation to the Dior one while the Maybelline product is a lot more sheer. I personally prefer the Essence Liquid Lipstick over the Maybelline Color Elixir's because they have a smooth and creamy formulation and better pigmentation. The benefit of the Maybelline range though is that there are a lot of unique and fun colours to choose from.